We think this is a great model that's usually available at a great price. It's not as feature rich as the other models, so its better suited for occasional use, an avid home chef should go with the Anova Bluetooth Sous Vide instead. 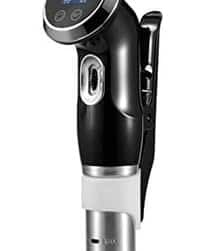 $77.34 Current Price - YOU SAVE 19%. 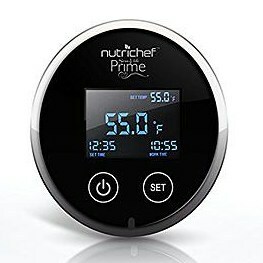 The NutriChef Sous Vide PKPC235BK is a good quality that's available at a very reasonable price. This model has specifications, controls, and display that look suspiciously similar to the Gourmia Sous Vide GSV140 and we suspect they are the same model on the inside. The Gourmia Sous Vide GSV140 model currently costs $89.99 and the NutriChef costs $77.34 we suggest choosing whichever one has the best price. This model is 16" in height which makes this model taller than the average of all the models we reviewed. It has a high impact polycarbonate housing and a stainless steel tube housing for the heating unit. It has an alligator style clamp, which is easy to set-up and cleanup and put away, but it doesn't off a lot of flexibility for vertical adjustment.Overall this was a solid well put together precision cooker. If you're not, someone who's going to use a sous vide cooker frequently this is a great choice, and it has a lot of features, is better than average quality, and has a great price. 16" x 3.5" x 3" 11.1" x 14.8" x 4.5" 16" x 3.5" x 3.5"
The NutriChef Sous Vide PKPC235BK is a better than average quality sous vide model, that has the most popular features at a great value price. It's a good choice for most people. The Anova WiFi Sous Vide is a high quality precision cooker that adds internet connectivity to your cooking.